As part of Liverpool’s Capital of Culture celebrations, 125 Superlambananas were commissioned and exhibited throughout Liverpool city centre during the summer of 08. Following the event, Liverpool-based Home Bargains, bought their own small flock at the Liverpool Lord Mayor’s charity auction, with the purchase including as many as 19 of the funky sculptures. 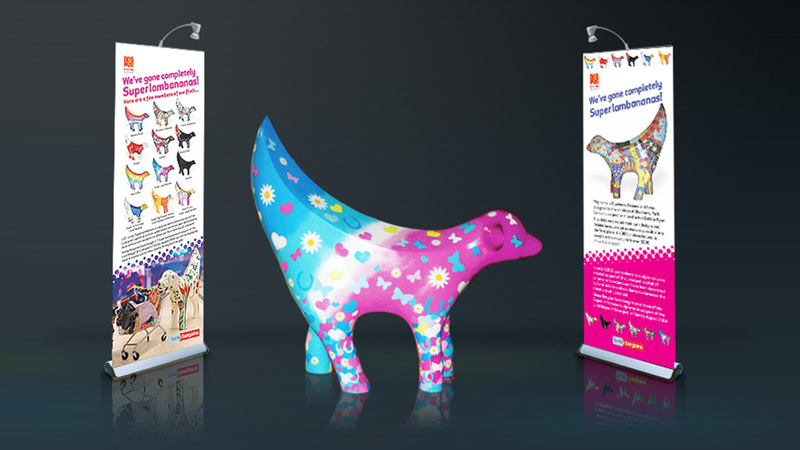 Home Bargains then commissioned Parker Design to create a series of colourful banner display designs that would accompany the Superlambananas on a tour of the Home Bargains stores across the whole of the UK. So we did just that. Inspired by the colourful energy and uniqueness of the Superlambanas, we created a set of banner display designs that really attracted attention to the main attraction. “We have used Parker Design on corporate, web, literature and store design projects for over 15 years. The sculptures never fail to draw a crowd and interest from the local press and, when flanked with the graphic banner display designs, are a cost-effective, extremely portable and memorable way of exposing the brand to current and future customers of all ages.